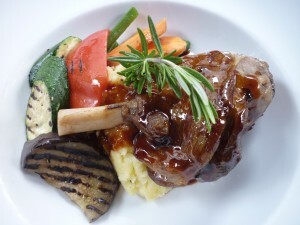 New Zealand Roast Lamb is a British institution and oven roasting a British invention (actually a Frenchman Francois Cuvillies in Englad but that is another story), but given the popularity of New Zealand lamb and its origins it is unsurprising that there is a shared love for this dish. The vegetable accompaniment to New Zealand roast lamb has developed into something more modern, due to the import and availability of a vast amount of vegetables. This can include anything depending on what the family like to eat. Mix the lamb shanks with the mint sauce, pepper and honey, ensuring they are completely covered and leave for 4 hours in the fridge to marinade. Pre-heat the oven to 200C for 10 minutes. Remove the lamb from the marinade and put in a roasting tin before placing the lamb on the top shelf to cook for 15 minutes. Remove the tin from the oven, and arrange so the lamb sits on top of the onions. In the meantime bring a pan of water to the boil and add the potatoes with a sprinkle of salt. Simmer over a medium heat for 15 minutes until they are soft all the way through and leave on the side to drain. 15 minutes to the end add a little oil to a frying pan over a low- medium heat. When hot add the garlic and mustard seeds. Cover and cook for around 5 minutes, shaking regularly to mix everything. When the mustard seeds have stopped popping and garlic has just started to turn brown, pour this a saucepan, with the potato, butter and milk. Mash over a low heat until completely smooth and any water has evaporated. Cover to keep warm. 10 minutes to the end, toss the aubergine and courgettes in a little oil before scattering on a griddle pan over a medium heat (otherwise on a tray under a low grill). Add the carrots and beans to the garlic/mustard frying pan and just cover with boiling water. Simmer over a medium heat for 8 minutes to soften, but so they resist being cut. In the meantime remove the lamb from the oven and cover with foil. Add the contents of the roasting tin (including bits stuck to the bottom) to a food processor and blend until smooth. Return your succulent New Zealand roast lamb to the roasting tin and place on the stove over a high heat. Drain around a quarter of the carrot and bean water into the tin. Boil vigorously until it reduces to a thick gravy.